Kings Lynn provided the venue to the opening of our 2017 Anglian League campaign, a delightful course set in prime heathland, with narrow fairways, lined by many hundreds of trees! It was clear, for those that have not visited before, that fairways and greens would be the order of the day. We practised on Saturday afternoon practise session, under the watchful gaze of Coach Shane Rose and a general feeling that the course suited our players games. That being said, the greens had received some spring work earlier that week, meaning that holing putts would be a challenge. The matches began on Sunday morning, in cold and breezy conditions. An early change to Norfolk’s team following the non-arrival of one of their players (he thought the match was in June!!! ), so Captain Kevin Webb dropped in, using a set of the diminutive Ian Yule’s clubs…..
First pair out, Ryan Connolly (Wellingborough) and Lewis White (Northampton) looked to be a strong pairing against the evergreen team of Ian Yule and Simon Clark (many years county experience between them) – a match that would go the distance. All square standing on the final tee box, a slightly pushed tee shot lead to Lewis having to create some magic from behind a tree. The shot that followed, was good enough to provide our boys with an unlikely hole and match winning par! The 2nd pair of Miles Mudge (Staverton) and Michael Farr (Priors Hall), we again had a good ball striking team. Up against Jamie Smith and recent winner of Norfolk county foursomes Warren Bates. This match again looked like going the distance but unfortunately the Northants pair could not make the ball fall into the hole, the ensuing loss on the 17th green felt a little unfair – but that is county golf sometimes! Match 4 saw the relaxed Sam Henfrey and League debutant Liam McNeela (both Northants County) pick up from where they left off from in the friendly match at Warwickshire. Playing flawless golf from start to finish, the pair completed the victory on the 12th green, with a 3 putt from their opponents – our boys went off to rest their feet and prepare for the afternoon singles. Match 3, playing last following the last minute change saw Fraser Carnihan (Cold Ashby) and Mikey Chambers (Overstone Park) take on Captain Kevin Webb and Richard Wilson (I Don’t believe it!). Despite using a set of golf clubs designed for a man some 8 inches shorter, Kevin produced an admirable performance in increasingly breezy conditions, with a series of holed putts from 10 to 15 feet keeping our boys at bay. Mikey and Fraser could not break free nor make anything go in their favour and were unlucky not to at least to get a half. So the morning finished with 2 points each, a long break at lunch gave the teams plenty of time to relax and the onlookers to warm up a little!! The singles matches commenced at 1.30pm, with a further freshening breeze and more evidence of players struggling to control the ball both on and off the greens. In what has been described as not a game for the purists, it became evident that will to succeed, grit and determination and hopefully a little luck on our side, things would go our way. It does also help having quality ball strikers throughout our team. Lewis White again took on the mantle as leader, going out at the top of our order. Taking on James Flesher, an opponent that had spent considerably less time on the golf course than Lewis had in the morning matches! This appeared to be another match that swung both ways, quite often. 1 up, 1 down, AS on the group messages from Match 1. All square on the 17th tee, Lewis pulled his tee shot and had to hit a provisional ball. Fortunately, his ball was found and playable near the 18th tee box and after another majestic pitch and run through the trees, Lewis left himself a birdie chance – his opponent in the middle of the fairway looked less than impressed! A half ensued and onto the 18th tee. After the tee shots, Lewis again found himself requiring some magic. With his opponent in the centre of the fairway again, Lewis was unable to extricate himself enough to be able to secure a par and when James holed his 4 footer for par, the match was over, lost 1 down. Following Lewis, Fraser Carnihan looked assured from the start, and with Norfolk native and Northamptonshire player Chris White on the bag, Fraser slowly and calmly set about his task. Easing his way to a 3&1 victory and extending his impressive singles record. Fraser’s ability to control his ball flight in these conditions, certainly shone through and with an assured touch on the greens the match was never in doubt. Sam Henfrey was up next and another dong dong battle, all the way to the last hole. Never was there more than 1 hole in this match. One thing you can be sure of with Sam, is that you can never be sure how he is doing, watching from a distance!! Walking to the last tee 1 down, Sam looked like he was just walking onto the first tee. A striped long iron from the tee and iron shot into the wind from 150 yards, landed flag high, on the fringe about 20 feet from the hole. With his opponent Simon Clark, not ‘in’ for 4, Sam wasted no time in nudging the ball down and across the slope, flag still in the hole with the ball soon to join it! A sensational 3 on a difficult finishing hole! Half a point against someone with Simon’s experience is no mean feat and the manner of Sam’s golf and attitude is refreshing! Looking back won the 18th fairway at this point, Michael Farr was strolling in after his match finished on the 16th green. It is fair to say Michael did not have his best afternoon on the course, struggling with his long game, round a golf course like that, there was really only ever going to be one outcome – again against experienced opposition. To be fair to Michael, after being 5 down at the turn he could easily have given up, but typical of this teams nature, his competitive spirit kicked in and he managed to win 10, 11 and 12 to get back to only 2 down – unfortunately the remaining holes offered up no further wins. At 5, Ryan Connolly started his singles match with the most impressive tee shot of the day. The first hole is 380 yards, up a gentle slope and into a strong breeze – Ryan’s drive looked amazing, sounded amazing and left himself just 107 yards to the flag! His second shot was not so impressive, but his long game stood the test of time for the duration of his match and was always in control. We had talked all weekend about the demand of the golf course and playing from the fairway – Ryan proved this in his match. Yes, there were one or two wayward shots in there, but in these conditions, that’s to be expected. I often wonder if Ryan knows quite how good a ball strike he is? This comfortable win should gain him some confidence. Behind Ryan was Mikey Chambers, equally impressive in terms of ball striking and a similar display to that of Ryan. Add to ball striking, Mikey’s tenacity and will and we have a serious competitor in our ranks! Mikey has made significant strides in his game over the winter, with the additional efforts he has made with Prevail, the Strength & Conditioning team. He is a totally different golfer compared to 8 months ago, he has the ability to flatten his ball flight out in conditions like these (Fraser will tell you that’s his doing!) and a touch on and around the greens to go with it. That being said, Mikey was getting frustrated on the greens early in this match. The result in this game was never really in doubt, Mikey making a solid par 3 on the short 16th to close the match out. It’s probably fair to say at this point that throughout the afternoon, the difficult conditions had affected many of the players. Our game plans designed on Saturday afternoon had to change and there were many more drivers being hit than we had planned. The wind was causing problems and it is fair to say the quality of golf could have been better. The wind, allied with the difficult putting surfaces were leading to mistakes and often in such conditions the players are forced to manufacture shots more than they would like. The Captain was preparing his hair dryer speech for the end of the game, feeling that as a group we had more than enough quality in our team to be winning this match. Miles Mudge in game 7 of the afternoon, playing Captain Kevin Webb had not been see too often (probably the fault of the Captain!). It was clear that Kevin was playing really good golf and Miles was up against it! 2 down with 2 holes to play, Miles hit the centre of the 17th fairway and an approach shot to 15 feet, some 25 feet closer than his opposition. On a green with severe slopes and seemingly much quicker than many of the other greens. The Captain perched himself on the 18th tee, waiting to give support for the final hole. However, making assumptions at this level, leads to a fall! Kevin holed his 40 footer, with at least 10 feet of break, leaving Miles no chance to extend the match. A real kick in the teeth for Miles, who was clearly not impressed…..Kevin admitted after the match that he had played much better than he could have imagined and probably the best front 9 of any of the players in the afternoon. This left the match tied at 5.5 points each, with just debutant Liam McNeela on the course. Things had not gone Liam’s way early in the match and was 4 down through 6 holes. After a brief and direct discussion with the Captain, Liam steeled himself and consequently won 4 of the next 5 holes to get the game back to level. This run started with the birdie of the day after a snap hooked drive on 7, leaving him on the edge of the 15th green, Liam threaded an 8 iron through a 6ft hole to 10 ft and holed the putt. Throughout the back 9 the game remained close and Liam got to one up playing 15. After another impeccable drive, Liam was in pole position but failed to find the difficult putting surface and went on to lose the hole, All Square. Onto the 16th and Richard hit a beautiful tee shot to 15 feet and would go on to hole the putt. 1 down, two to play. At this point Liam and the Captain again had a brief discussion, where the Captain reminded Liam of a discussion earlier in the day about the opportunity of winning the final match, to win the game. Again, Liam responded with two fine shots into the 17th, 10 feet under the challenging hole location. With his opponent short sided after missing the green, Liam didn’t need to use his putter after a bogey 5 from Richard. Onto the tough and tight, doglegging 18th, 380 yards, into the breeze. Liam found the concentration and talent to stripe his tee shot into the middle of the fairway, leaving himself 145 yards to the flag. To his credit, Richard also found the fairway, slightly closer to the green. Liam’s iron shot, controlled beautifully into the wind, found the right side of the green, perfectly flag high, about 20 feet for birdie. Richard’s approach finished some 35 feet away, with a long, swinging uphill putt to come. It’s probably obvious now, but everything was riding on this match – and remember what we have already said about making assumptions at this level. Richard’s putt rolled some 7 feet past the hole and left a downhill, swinging putt on a similar line to which Liam was just about to putt down. Liam’s birdie attempt finished 2 feet short and apparently on line with the hole – Gimme? No…..Richard’s par putt lacked the speed or line required to fall into the hole, so Liam was left with the match winning, 2 foot putt. With the benefit of youth on his side, Liam placed his ball down, stood over the putt and knocked it in. A fabulous performance on his debut, from the depths of despair early in his match, to being the match winner! So with the win to our name, the players were spared the Alex Ferguson style hair dryer treatment and instead we all enjoyed the winning feeling together. This victory was about the teams tenacity, desire and will to win at all costs, more than it was the overall standard of our golf. Winning ugly, is a character in sport that is well sought after and the boys should all be very proud and pleased with the combined efforts! 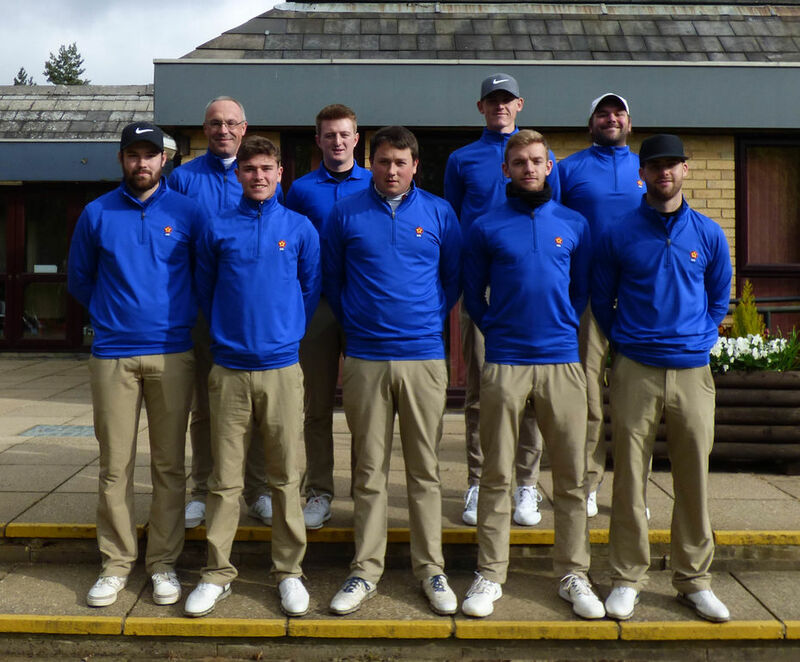 So a great start to our Anglian League campaign – Seacroft Golf Club for the Eastern Counties Foursomes in two weeks time, followed another two weeks later by the second League fixture, at Wellingborough against Lincolnshire.